ont le plaisir de vous convier à la troisième séance du séminaire « Médias imaginaires : Les Médias invasifs », le jeudi 6 décembre 2018 de 17h à 19h. Where is one to locate “power” when speaking of media (or of “mediarchy”)? Inside, rather than above, as it is the case in our imaginary of political power (the King, the President, the boss), or rather than below, as it is the case in the Marxist economic theory of the infra-structures. The power of the media is not so much ubiquitous as it is intra-structural. Invasive media invade us from the inside! What can that mean? That is what this talk will attempt to figure out, first in presenting a few general theses, then in opening the discussion on their validity. 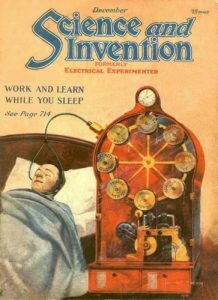 Electronics can be thought of as the politics of electricity, a social dynamic of particular concern to those deemed « mad, » « insane, » and « psychotic » over the past two centuries. This talk examines the historical power(s) imagined to be behind the biopolitical drive toward invasive electronics, a paranoid project that often concretizes the metaphorical association of the body and the « body politic. » From the 19th-century asylum to the « Truman Show Delusion, » the « mad » have demonstrated a frequently cogent suspicion, not only of media technologies, but also of the larger « systems » believed to develop and enforce a politics of the electronic.